At the Farber Soul Center, there is no shortage of “A-ha!” moments. For Noah Sriro, 24, who works in the Soul Cafe, it’s the joy of his very first tip—tangible recognition for a job well done. For facilitating staff artist Carolyn Morris, it’s the joy that comes when a fledgling artist discovers he can weave a scarf in a pattern of his own design. For volunteer artist Lori Champagne, it’s the joy of introducing an artist to a new technique and watching the creativity flow. And for parents of young adults with special needs, it’s having a place where their sons and daughters can go to learn new skills and take pride in their accomplishments. Located at Walnut Lake and Drake roads in West Bloomfield, the Farber Soul Center will hold its official grand opening on Sunday, June 5. Within the 18,000-square-foot facility is the Soul Cafe, (open now); the Dresner Studio, where artists can work in a variety of media; an art gallery (sponsored in memory of Burt and Geri Rissman); and a reception hall. The Rissman Gallery will offer the artists space to display their work; they will receive commissions from the sale of their art. Like many of the projects that have sprung from Friendship Circle in West Bloomfield, Mich., the Farber Soul Center began as an idea, prompted by the realization that many of the early Friendship Circle participants had entered young adulthood, and were facing a lack of vocational and social opportunities. Some were experiencing isolation, spending time at home because of the gap in appropriate programming after school ended. 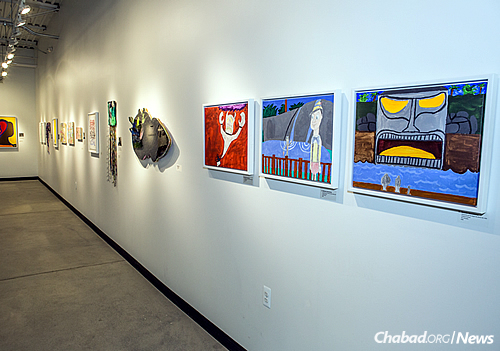 Shemtov, motivated by her belief that art is a powerful means of unleashing creativity, began researching programs around the country to bring together the elements that would become the Soul Center. She was especially impressed with Gateway Arts in Boston, Creative Studio in San Francisco and Do Art in Bay City—studios where artists with special needs created, displayed and sold their works. As far as she knows, the Soul Center is the only place for young adults with special needs where art studios and a restaurant are combined. She expects the Soul Center to become a national model for Friendship Circles and other organizations outside of Michigan. Another substantial grant from the Dresner Foundation, in memory of Vera and Joseph Dresner, provided funding for the studio that bears their name. The Soul Center campaign is currently set at $5.5 million, and $4.7 million has been raised so far. An endowment also is in the works for this program, with $1 million already raised. Additional donations from a variety of community members furnished the studio with a kiln, a laser-cutter, and other state-of-the-art machinery and tools worthy of a professional art studio. The artists and staff members were delighted to move into their permanent studio location, which includes the Friendship Lounge, a comfortable space with its own kitchen where employees can take lunch and coffee breaks. Art programs director Brian Kavanaugh, who ran a similar program in Buffalo, N.Y., and earned an MFA degree at Cranbrook Academy of Art in Bloomfield Hills, said working in the temporary space allowed them to work out scheduling issues and learn to make the best use of volunteer artists who have become part of the Soul Center. Currently, about 20 young-adult artists come weekly for varying amounts of time. Over the summer, the studios will be open from 10 a.m. to 3 p.m., Tuesday through Friday. Artists can choose to work the full five hours or less, depending on individual needs and schedules. 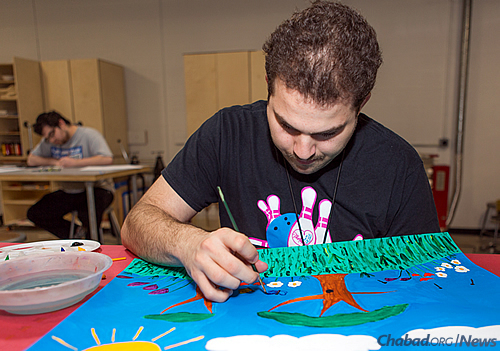 According to Shemtov, the studio space can accommodate about 45 artists a day. There is a charge for artists to participate in the program, and Shemtov eventually hopes to reduce the costs and increase the number of participants. Customers at the Soul Cafe or other visitors are welcome to watch the artists at work in the studios. “We want the public to view them as true artists, not artists with special needs,” said Shemtov, adding that artists receive 40 percent of the sales from their work. David Kole has been working on his chess sets for about 10 months with facilitating staff artist Adam LaVoy. 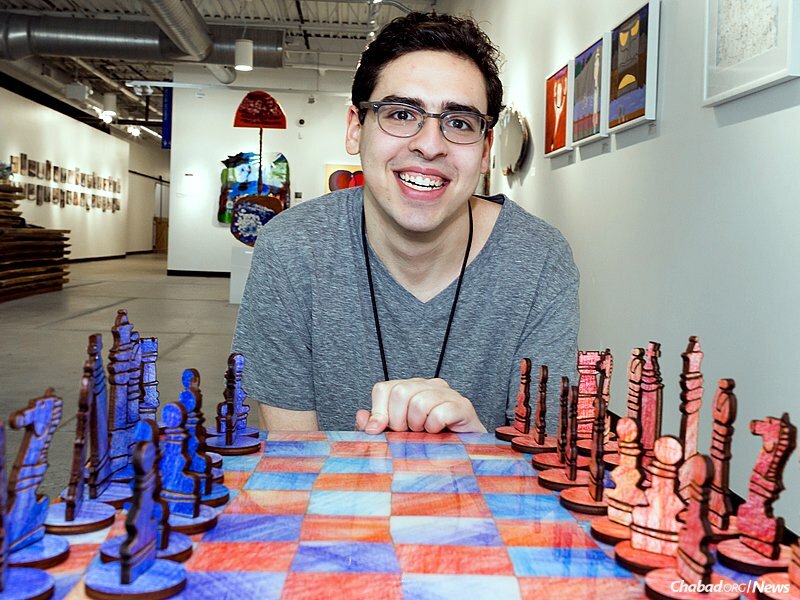 A chess set featured on the cover of the local Detroit Jewish News, which came from Kole’s own drawings and was colored by artist Rena Cohen, has been bought for $500 by Dr. George Dean, a world-renowned local collector. The young artists can choose from cutting-edge digital arts such as photography, computer animation, graphic design, laser-cutting and 3D printing, as well as traditional art forms that include painting, ceramics, weaving, jewelry and mixed media. 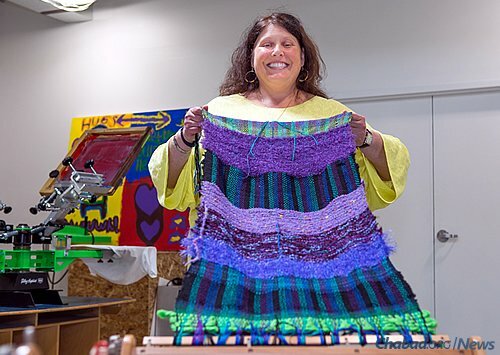 The fiber studio, run by facilitating staff artist Carolyn Morris, has looms in various sizes for creating small items such as placemats to large wall-hangings and room-size rugs. Mezuzah cases created from fiber-glazed weavings have become popular gift items. Other studios are devoted to textiles, where artists can learn silk-screening techniques, wood-working and printmaking, including traditional block printing and chine-colle, a mix between printmaking and collage. There is also a studio for visiting artists, who are invited to use the equipment and facilities, and share their expertise with the young-adult artists. While the Dresner studio is feeding the artistic soul, the Soul Cafe provides a different kind of nourishment in the form of healthy and delicious meals, snacks and coffee drinks in a casual setting designed for comfort and communing. 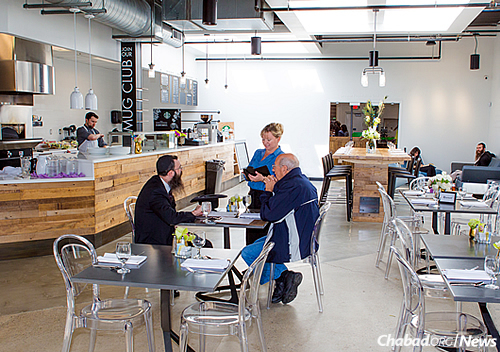 The restaurant is run by Epic Kosher Catering’s Milk & Honey—supervised by the Council of Orthodox Rabbis of Greater Detroit (Vaad Harabbonim)—under the leadership of Chef de Cuisine Hunny Khodorkovsky, but the staff includes a mix of professional cooks, servers and young adults with special needs who are being trained in the various aspects of restaurant service. Employees such as Noah Sriro, Jordan Weinfeld and Sam Morris perform various functions under the guidance of lead restaurant staff trainer Kim Kaplan, who uses her background as a special-education teacher to help the trainees develop their skills and learn appropriate workplace protocol. The training involves educational, vocational and behavioral components. She encourages the other restaurant staff members to use positive reinforcement to help the trainees meet the expectations of their respective jobs, which range from refilling water glasses, setting and clearing tables, washing dishes, sweeping the floor and other tasks that keep the restaurant running smoothly. 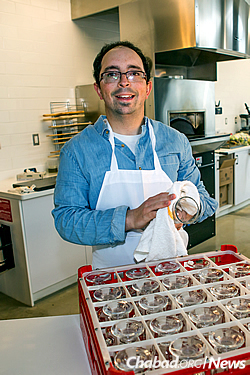 Some perform food preparation such as peeling potatoes, measuring cookie dough and making egg wash for the Friendship Challah, which is baked and sold in the restaurant. Some of the trainees are receiving a paycheck for the first time; others have been employed before in situations that were not conducive to success. 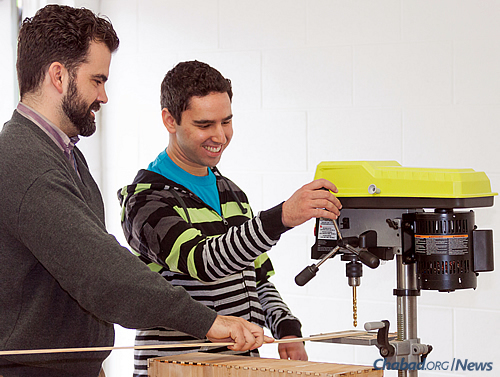 Kaplan helps them learn new skills by breaking tasks down into manageable bits. “Small steps become big steps,” she said. Khodorkovsky or “Chef Hunny,” as she is called, wants the Soul Cafe to be a destination where people come together to enjoy good food in a welcoming, inclusive atmosphere. The kosher dairy restaurant is currently open six days a week (closed on Saturday) for breakfast and lunch. Selections include omelets, authentic Israeli shakshuka, pastas, pizza, fresh fish, salads and soups, all using fresh seasonal ingredients. Vegetarian and gluten-free dishes, such as pizza with cauliflower crust, are plentiful. An in-house kosher Starbucks (chalav Yisrael) offers coffee drinks, tea, lemonade and smoothies. Everything is made on the premises; even the syrups used in the lattes and other beverages are preservative-free. For the young-adult workers, the Soul Center is a place to learn and grow in an environment of acceptance and encouragement. For their parents, it is a haven within a world where tolerance is not always a given. What does Noah plan to do with his first paycheck? “I’m going to put it in the bank,” he said wisely. 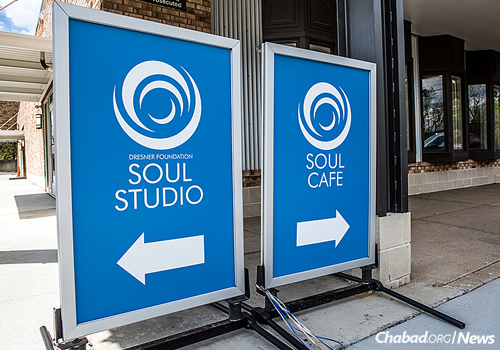 The grand opening of the Farber Soul Center will take place on Sunday, June 5, from noon to 3 p.m., at 5586 Drake Road in West Bloomfield, Mich. Tour the center, meet artists, shop and enjoy lunch in the Soul Cafe. RSVP to friendshipcircle.org/openhouse for 10 percent off lunch. The Soul Cafe is now open Sunday to Friday; breakfast is from 7 a.m. to 11 a.m., and lunch from 11 a.m. to 3 p.m. Reservations are accepted, but not required. For more information, visit FCSoulCafe.com. For Soul Center studio programs, see the Friendship Circle website here. The article was reprinted with permission from the Detroit Jewish News. The original article can be read here.